As an award-winning author, energy healing therapist-coach, intuitive counselor, holistic nurse, Certified Traditional Naturopath, founder of Energypathy Healing® and transformational entrepreneur with over thirty years of experience in healthcare – half in clinical nursing and half in energy medicine – it is my passion to be a conduit of physical, emotional, mental, and spiritual healing for others. And it is my mission is to challenge how we think of medicine. For over two decades I have avidly studied energy healing, natural health, and the science of transformation. After completing a Doctorate in Traditional Naturopathy, I became certified by the American Naturopathic Certification Board. I am also an ordained healing minister, a registered wedding officiant, a musician, and a lover of nature. Although we have twice the life expectancy of our ancestors, the quality of our lives is increasingly diminished by chronic physical, emotional, mental and spiritual health issues due to a pervasive lack of knowledge of their core causes and treatment. Weaving together mind-body health information with scientific studies and true-life stories of healing, this comprehensive guide to a healing way of life will help you learn the key to working with health issues, taking you beyond symptom elimination into growth, transformation and radiant joy.The Other Medicine That Really Works is an amazon bestseller and winner of 18 national and international book awards that restores the knowledge that is your birthright. You will never see healing or medicine the same way again! Are you experiencing upheaval in your life and a lack of success and fulfillment related to your health, relationships or career path? Do you feel called to work with social and environmental problems, bring healing and knowledge to others, or to make a difference in the world — but are unable to realize your greater aspirations? 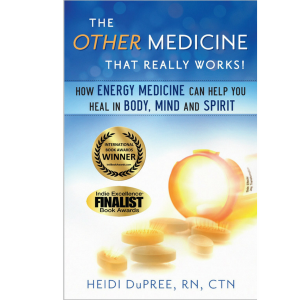 Through practical information on energy medicine and true-life stories of transformation, you will discover your true source of power, health and happiness in this Amazon bestseller and winner of 16 national and international book awards. 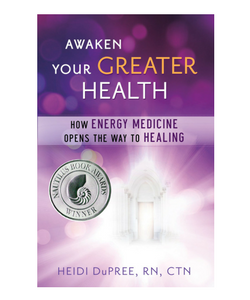 Awaken Your Greater Health is the roadmap to guide you out of turmoil to where greater energies can rule your life. These meditations will help you remember who you really are, and guide you to become more fully aligned with your innate value and wholeness. This audio program will support you in making the shift from conditioned, lower-self reactions to a more conscious creation of your life. Are you experiencing burn-out, low energy, not feeling good enough, not having enough passion, love, money, or business? Are you struggling with health and relationship issues? 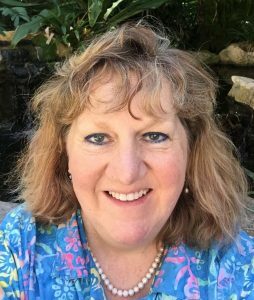 Heidi offers online energy healing coaching sessions conducted by Skype, FaceTime or Google Hangouts. Your recorded session includes Reiki energy healing, EFT tapping, intuitive counseling, discussion of your life purpose, and a follow-up email with a recap of the session and any suggestions. She specializes in working with sensitive and creative women and caregivers, mentoring healers, coaches, nurses and others in the human services field, and teaching women who want to become healers and coaches.